Today, Trump managed an admirable eulogy to the victims of the 9/11 atrocity. It brought back sad memories for me. I was attending PRINT '01 as an exhibitor (creo (CreoScitex back then)). The show was about twice the exhibit space of the largest Graph Expo and Converting Expo events, and was scheduled to take place September 6-13 2001 at the McCormick Place Complex in Chicago. I was staying at the W Hotel in downtown Chicago and, as per the company policy, I was sharing the room with a coworker. Because I had a presentation to do first thing on the morning of September 11 I awoke about 6 am and decided not to turn on the television so as not to disturb my room mate. I took a taxi to McCormick Place and was quite surprised at how untalkative the clearly Muslim driver was. But, after all I thought, it was very early in the morning. Arriving at McCormick Place I quickly headed through the empty building to the CreoScitex "sales bunker" - the virtual office and IT room for sales people to use at the show. Scattered throughout McCormick Place are television monitors that are tuned to CNN but with the audio off. I glanced quickly at the screens as I walked through the center. The scene that I saw on the screen just looked like a pair of giant smokestacks spewing plumes of black soot so I assumed they were doing a story on industrial pollution somewhere - likely in the Balkans an area that was much in the news at that time. So I continued on my way into the sales bunker. In the sales bunker I tried, but couldn't get on the Internet to check my email. Then I tried to check my voicemail with my cell phone but couldn't get a signal. Frustrated, I proceeded to the CreoScitex booth where the IT guys hid out when setting up our booth. They should be able to figure it out I thought. Walking through the exhibition halls I noted that many of the exhibitor's equipment was covered with American flags. So typical of the U.S.A. I thought to myself. I arrived at the booth and started to organize myself for the presentation that I was scheduled to do and a co-worker at the booth came over to me and asked: "Have you heard the news?" The news took a while to sink in. No presentation today. This would be the last day of Print '01. I decided to walk back to the hotel - all the time trying to get a signal for my cell phone so I could let my wife know that I was OK and not to worry. It was two hours before my phone was able to get a signal and I could make the call. As news reports started coming in there was talk of a jet en route to Chicago and that the Sears Tower might also be hit. As a result, most stores and restaurants were closed. Once back at the hotel, like many of my co-workers, I just wanted to get back home. The news was that all flights were cancelled for at least the next few days which meant that my return flight ticket for September 14 was no good. A call in to the CreoScitex travel agents revealed that we were on our own to figure out how to get back to Vancouver. Fortunately I linked up with a small group in the lobby of the hotel and managed to rent a passenger van - at a highly inflated day rate. It took a group of us just 24 hours to travel the 2,200 miles back home. Guards at the Canada/US border were heavily armed (something I'd never seen before) even at 3 AM when we crossed the border back into Canada. During that drive from Chicago I only saw one airplane - a military transport plane. Other employees made their way from Chicago through Toronto (where planes were still flying and where Canadians gave US travellers refuge) and back home. Like fine dust thrown against the wind, evil falls back upon that fool who offends the inoffensive, pure and guiltless. Senior year of high school for me. Woke up to the radio and when I heard them announce it I pictured a small plane into a nondescript building. I continued to shower and get ready for my day. Once I turned on the TV I realized how big it was. I think I started watching right before the second plane hit or caught an early replay of it. Continued on my way to school, pretty somber day. Nicely put Gordo. I lost some friends that day, as so many others did, too. On such occasions, it's good to reflect on those past atrocities. I was on the Autobahn underway to a customer in Altona for Esko. I saw more and more cars stopped on the hard shoulder with people out of their cars starting into the distance. Then I heard it on the radio and stopped too. That was the day the Autobahn ground to a halt and we were all American. I attended Print '01 on Monday the 10th returning home that evening. The next morning started out as a typical day.....until I saw everyone huddled around the TV in the break room. Gordo, like you I was on my way to Print '01. But my trip was from Grand Rapids, MI to Chicago via train. My first train ride actually. Which back then we did not have internet on my phone, just portable headphones with stereo. The train was stopped numerous times on the way. I got on the train about 6am EST, before anything happened. But by the time we rounded Lake Michigan at the bottom and well into Indiana, the train was stopped to go through all the baggage and everyone's tickets and carry-ons. Quite unnerving. Most of us still did not even know what was going on at that time. But boy were we all asking questions. I remembering turning on my radio and checking for any info, and then sharing with the other riders around me. All in shock. We were stopped there for about 1/2 hour. Eventually got started again, but were stopped about 1/2 hour out of the train depot in Chicago again for another 1/2 hour. And like Gordo, we heard reports that the Sears Tower was a potential target next. Eventually got into the train depot, and everything was packed. No trains leaving until end of day, no vehicles to rent, no planes to fly out on. No buses available to get seats on. Everything was booked up or shutdown. Like the city was on lock down. I came out of the depot up to the street level and saw the buildings around me (after seeing a little bit of the video of the planes hitting the towers), and I turned right back around, and headed back down to be with my other fellow citizens. And that is where I stayed for the next 8 or so hours watching the news, hearing people trying to get out of the city, talk to their loved ones, and waiting to get the next train out of the city back to my loved one. This experience shook me so much, this is the first year since, that I have been able to actually watch any news or reports about 9/11. Not only do I have this story, but my father is a firefighter, and I know quite a few other ones to, and I know they all would have done the same as House #10 and the rest of the houses in NY. 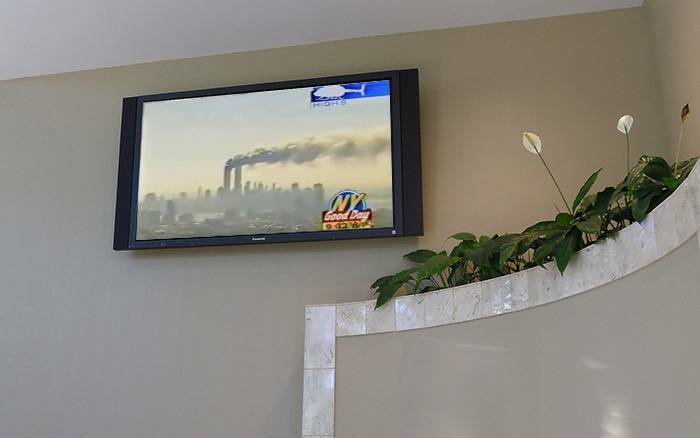 Like many of you, I also remember 9/11 in connection with Print '01. In my case, I left our booth early to fly home on September 10 to return for a scheduled medical appointment for my very young daughter. That evening I flew from Chicago to Minneapolis on a full plane. There was one passenger that seemed, well, just nervous and kind-of on edge. I clearly remember thinking, "If something goes wrong with this flight, that guy is going to have something to do with it." We both followed our connection in Minneapolis home (safely) to Fargo that same night, September 10. Then the next morning, September 11 happened. I'm sure there was ultimately no connection between the guy that caught my eye on September 10 and the events of September 11, but that memory of the night before is as real for me as the memory of September 11. I had a private demo with a client at the Heidelberg booth prior to the show opening. I showered, had coffee, did not have the tv on and hopped a cab to McCormick Place. Once there, I was going up the escalator and noticed there was about 30 people surrounding the kiosk with CNN on. I walked up and saw one tower smoking. I was in shock. As we stood watching, the second plane hit. At that point we all knew it was not an accident but an act of terrorism. No cell signals, no one could get out to check on their families and friends. My colleagues from N.Y. really had it rough, one was a volunteer fireman. Unfortunately, this is a day I will never forget, may God rest the souls of all the murdered victims.